Switching to Water Efficient Fixtures: Save $$$, Energy, & Natural Resources | GSK Climate Control, Inc. Improving water efficiency in your home or business can reduce operating costs, energy consumption, and the strain on our natural resources – specifically our fragile water infrastructure. With energy efficiency becoming an increasingly talked-about topic in today’s world, filled with climate change concerns, increasing energy prices, extensive droughts, and dwindling resources, nearly all consumers are looking for new ways to cut costs and safeguard our ecosystem. In 2006 the EPA (United States Environmental Protection Agency) developed a partnership program called ‘WaterSense’, to provide high efficiency plumbing fixtures that will save water, conserve resources, and cut utility costs for consumers. 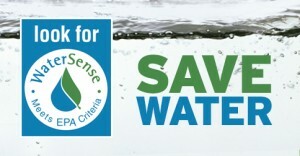 ‘WaterSense’ labeled products are independently certified to use 20% less water than the federally mandated minimum, without forfeiting quality or performance and are available in hundreds of popular fixture brands, such as; Kohler (GSK’s most “in demand” fixture brand), Moen, American Standard, & Delta. The average American uses more than 300 gallons of water each DAY in their home and spends on average, $1,100 each year on water utilities. Checking for household leaks (i.e. shower heads, faucets, toilets, plumbing lines, leaking hot water heater/storage tanks) and correcting these problems can help save you 10,000 gallons of water each year alone, which is the equivalent to washing 270 loads of laundry. Replacing old toilets can save 13,000 gallons of water each year, exchanging old shower heads with new ‘WaterSense’ ones can save 2,400 gallons, and upgrading faucets and aerators to their ‘WaterSense’ counterparts can save 700 gallons annually. If every household in the U.S. upgraded their fixtures and appliances to low-flow, or ultra-low-flow, water efficient substitutes, the country as a whole could save over 3 trillion gallons of water, in excess of $18 billion American dollars each year. Approximately half of your average household water use takes place in the bathroom. Your outdated toilets are the #1 water wasters in your home, accounting for around 30% of your home’s indoor water utilization, followed by showers which generally account for 20% .The federally mandated minimum flow rate for faucets and shower heads is 2.5 gpm (gallons per minute). For a toilet the minimum flow rate is 1.6pf (gallons per flush). Keep in mind, these federally mandated minimums apply only to newly manufactured products. ‘WaterSense’ labeled faucets exceed the industry standard by providing 1.5 gpm. Their shower heads meet a ‘WaterSense’ product standard of 2 gpm and the toilets exceed federally mandated minimums by using no more than 1.28 gpf. If you have a toilet circa 1992 or older, you could be wasting up to 7 gallons per flush! The process of flushing your toilet, elucidates around 38% of your household water each day, accounting for more than one third of your daily water consumption. A family of four could save more than 25,000 gallons of water by replacing their outdated toilets with new ‘WaterSense’ labeled alternates, which could in turn, reduce half of your total bathroom water usage. Installing ‘WaterSense’ label faucets and aerators in your bathrooms and kitchens are easy and effective ways to improve water efficiency – aerators determine the max flow rate of water from your faucet and are very inexpensive to purchase and install. Buy an aerator that has a rating of 1 gpm or less for ultimate efficiency. In addition, homeowners can cut their shower water consumption up to 70% by replacing old, leaky, inefficient shower heads with a ‘WaterSense’ labeled deviate. Those luxury, extra large, jungle-downpour imitating shower heads and ‘shower towers’ could be wasting up to 20 gpm, in which case, converting to a slightly more modest pie-sized ‘WaterSense’ model could save you even more! As reported by EPA’s ‘WaterSense’ program, ultra-low-flow shower heads can save enough energy to power your tv for a year, which accounts to 300 KwH (kilowatts per hour) saved on your electric bill! Replacing just 1 shower head in your home with a ‘WaterSense’ substitute saves the average american family around $70 on yearly water utility and preserves enough energy to power a household for 13 days out of the year. Did you know, running a faucet for 5 minutes consumes enough power to let a 60-Watt light bulb run for 14 hours? Interestingly enough, many consumers don’t realize that water savings, can not only put more money in your wallet whilst conserving the environment but it can also substantially lessen your electric, natural gas, and/or oil bill. Every time you turn a faucet on, run the shower, your dishwasher, etc., you’re paying utilities to heat, pump, and deliver the water to your fixture or appliance. For example, homes with electric water heaters expend over a quarter of their electric bill just to heat water for their home. Water heating is the second largest energy expenditure in the home, totaling approximately 18% of your average utility bill, after heating and cooling expenses. The total annual energy used to deliver and treat water for household use in just 10 homes, could operate a large fridge for well over 2 years. Choosing to insulate your electric hot water storage tank or natural gas hot water storage tank, as well as the first 6 feet of hot and cold piping connected to your hot water heater can help save the amount of energy required to heat your water. Additionally, having approximately a quart of water drained from your hot water storage tank every 3 months will remove the type of sediment that can interfere with heat transfer, thus lowering the efficiency of your water heater. Natural gas on-demand hot water heaters OR tankless hot water heaters are much more economical options. Heat pump water heaters as well as a solar hot water heaters are great energy efficient options that will significantly lessen your greenhouse gas footprint associated with electricity. However, both options depend on location. (For a solar hot water heater you will need to have an unshaded Southern-facing outdoor location for the placement of solar panels.) Installing a drain-water waste heat recovery system can also be extremely effective in dwindling your utility bill. If you are interested in upgrading to any of the more sustainable options such as the heat pump or solar water heater, be sure to check out www.dsireusa.org to explore any state tax credits and rebates available for your eco-concious upgrades.